Swedish house prices are expected to continue falling this year. The background: stricter mortgage requirements; deteriorating investor confidence, coupled with slowing economic growth. Sweden's nationwide house price index fell by 1.53% (-3.55% inflation-adjusted) during 2018, in contrast to y-o-y rises of 7.57% in 2017, 6.29% in 2016, 12.5% in 2015 and 8.57% in 2014, according to Statistics Sweden. During the latest quarter house prices were unchanged (fell slightly by 0.19% inflation-adjusted) in Q4 2018. Greater Stockholm house price index fell by 7.1% y-o-y in 2018 (-9% inflation-adjusted), compared with last year's rise of 4.5%. Quarter-on-quarter, house prices dropped 0.7% during the latest quarter. Greater Göteborg house prices dropped 2.1% (-4.1% inflation-adjusted), in contrast to a y-o-y surge of 9.9% a year earlier. House prices rose by 1.2% during the latest quarter. Greater Malmo house prices increased a meager 0.6% (fell by 1.4% inflation-adjusted), a sharp slowdown from a y-o-y growth of 10.5% in the prior year. Quarter-on-quarter, house prices dropped 0.2% in Q4 2018. Demand and supply are now falling. The total number of homes sold in one- to two-dwelling buildings fell by 4.9% y-o-y to 52,299 units in 2018, according to Statistics Sweden. Recently, the National Institute of Economic Research revised downwards its 2019 growth projections for Sweden to just 1.3%, from an earlier forecast of 1.9%, amidst a decline in housing investment. The Swedish economy grew by about 2.3% last year, after annual growth rates of 2.1% in 2017, 2.7% in 2016, 4.5% in 2015 and 2.6% in 2014, according to Statistics Sweden. Swedish property yields are moderate. This year, we were unable to get yields figures because rents were hard to get in sufficient quantity to be reliable. When we surveyed them last year, mid-sized central Stockholm apartments (80 to 120 sq. m.) had the most generous gross yields, at 6 to 7%. Other sized properties seemed likely to have lower yields, at around 3 to 4%, and properties in suburban Stockholm also had relatively lower yields, at 3% to 5%, while apartments in the centre of the second-largest city of Gottenburg can yield around 5% to 7%. Because rents are tied to the age of the property, the higher yields in the city-centre reflect partly the newer housing stock in those areas. Generally, property prices in Stockholm vary in a range from €6,000 to €7,500 per square metre. Rental Income: Rental income is generally considered as business income and taxed at progressive rates. Income-generating expenses are deductible when computing the taxable income. Capital Gains: Capital gains tax is levied at a general rate of 30%. Acquisition costs are deductible when computing the taxable gains. Inheritance: Inheritance tax in Sweden has been abolished since January 2005. Residents: Residents are taxed on their worldwide income at progressive rates. Closing costs range from 7.26% to 9.26%. 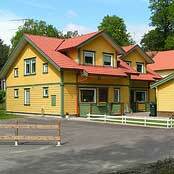 The buyer pays stamp duty (4.25%) and registration fee of SEK825 (€96). The seller pays the real estate agent’s fee (3% - 5%). When the buyer and the seller reach an agreement, the former pays a deposit ranging from 2% to 10% of the purchase price. Recently, the National Institute of Economic Research revised downwards its 2019 growth projections for Sweden to just 1.3%, from an earlier forecast of 1.9%, amidst a decline in housing investment. The housing market and construction sector are key drivers of economic growth in Sweden. The Swedish economy grew by about 2.3% last year, after annual growth rates of 2.1% in 2017, 2.7% in 2016, 4.5% in 2015 and 2.6% in 2014. Because of persistently low inflation, the Swedish crown continues to plummet against the euro, losing almost 10% of its value in the past two years, with the monthly average exchange rate reaching SEK 10.502 = EUR 1 in February 2019 – the lowest level in almost a decade. Likewise, the Swedish crown also lost about 13% of its value against the US dollar in the past year, from a monthly average exchange rate of SEK 8.0552 = USD 1 in February 2018 to SEK 9.2523 = USD 1 in February 2019. Inflation was 1.9% in January 2019, slightly down from 2% in December 2018 but up from 1.6% in the same period last year, according to Statistics Sweden. The Swedish central government recorded a budget surplus of SEK 80 billion (€7.58 billion) in 2018, equivalent to about 1.7% of GDP, up from surpluses of 1.3% in 2017, 1.2% in 2016, 0.2% in 2015 and a deficit of 1.6% in 2014. As percent of GDP, debt decreased to just 26% - the lowest level in 40 years. However government finances are expected to weaken in coming years amidst the economic slowdown. “The new forecast shows that the budget balance will turn from a surplus of SEK40 billion (€3.8 billion) in 2019 to a deficit of SEK 30 billion (€2.84 billion) in 2020,” according to the Swedish National Debt Office. Unemployment stood at 6.5% in January 2019, down from 7% a year earlier, according to Statistics Sweden.